A superb print of a 1938 Spitfire Mk1 from Duxford-based No.19 Squadron, flying over the white cliffs of Dover accompanied by a No.19 Squadron Hawk in matching camouflage. 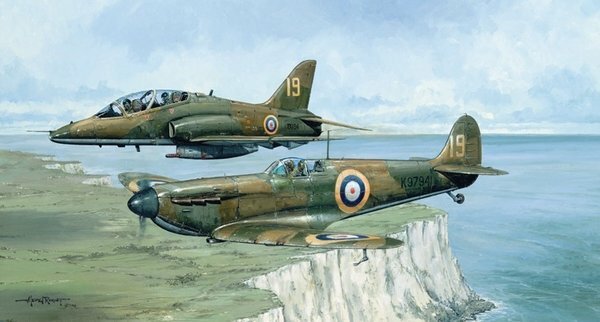 Details A superb print of a 1938 Spitfire Mk1 from Duxford-based No.19 Squadron, flying over the white cliffs of Dover accompanied by a No.19 Squadron Hawk in matching camouflage. This print, published in a very small edition, has a unique collection of rare signatures, including 3 Battle of Britain Spitfire pilots from the same squadron.